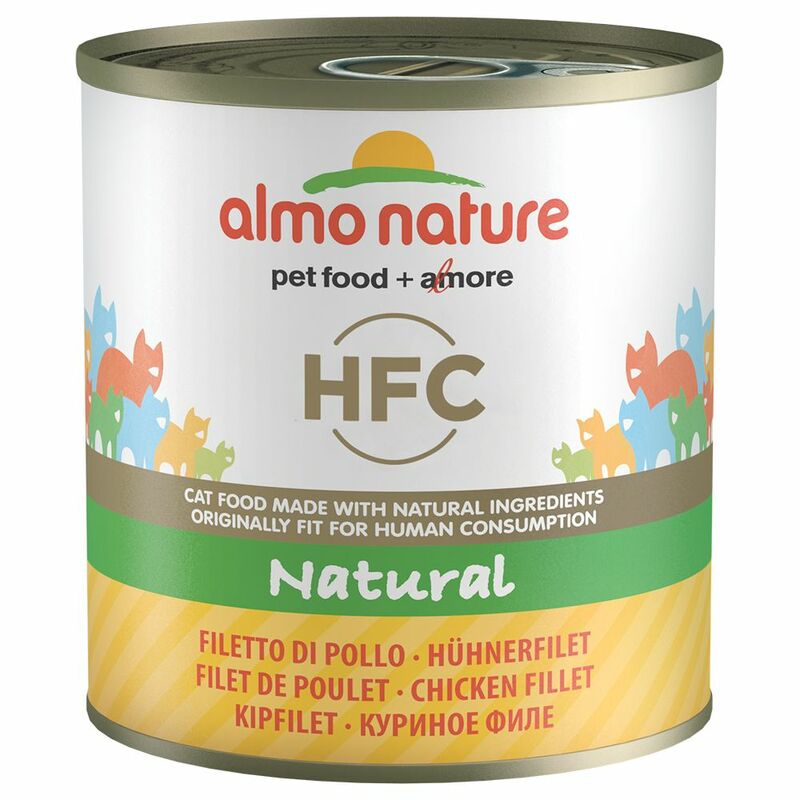 Treat your cat to this delicious Almo Nature HFC, which uses only the best meat, poultry and fish chunks combined with ham, cheese and vegetables. Each ingredients that goes into the varied range of flavours is high-quality, fresh and of human grade quality. The gentle preparation method uses the food's own stock in order to maintain the natural great flavour and valuable micronutrients. The light recipe also ensures that your cat's body will not be overloaded with unneceΒary calories. All varieties of Almo Nature HFC are grain- and gluten-free, making this delicious wet food suitable even for sensitive cats. The recipe is also free from artificial additives such as colours, flavours and preservatives. Almo Nature HFC 12 x 280g at a glance: Supplementary food for cats of all ages Available in a range of different flavour varieties With fresh, high-quality ingredients: with 38% - 59% finest quality fresh meat and fish, as well as ham, cheese or vegetables, of human grade quality Natural: cooked and preserved in its own stock, making it naturally flavoursome and digestible High nutrient density: gentle preparation preserves valuable natural micronutrients Gluten- and grain-free: also suitable for sensitive cats Light, tasty formula: species-appropriate recipe that won't overload your cat with unneceΒary calories Free from artificial additives Please note: Almo Nature cat food is entirely natural. Every single flavour of Almo Nature wet food (tuna, chicken, salmon etc.) contains its own natural proportions of vitamins, minerals (e.g. calcium, phosphorus) and taurine. Almo Nature therefore recommends a diet which is based on a variety of different natural foods (red meat, poultry, fish, dry and wet food). The varying nutrient contents of this variety will ensure a balanced diet for your cat. Almo Nature HFC is a supplementary wet cat food.